NEW DELHI | MUMBAI: US President Donald Trump’s inauguration pledge to ‘Buy American-hire American’ has stoked interest in jobs back home from overseas Indians, who are increasingly reaching out to manpower consultants in the country to explore equivalent options. 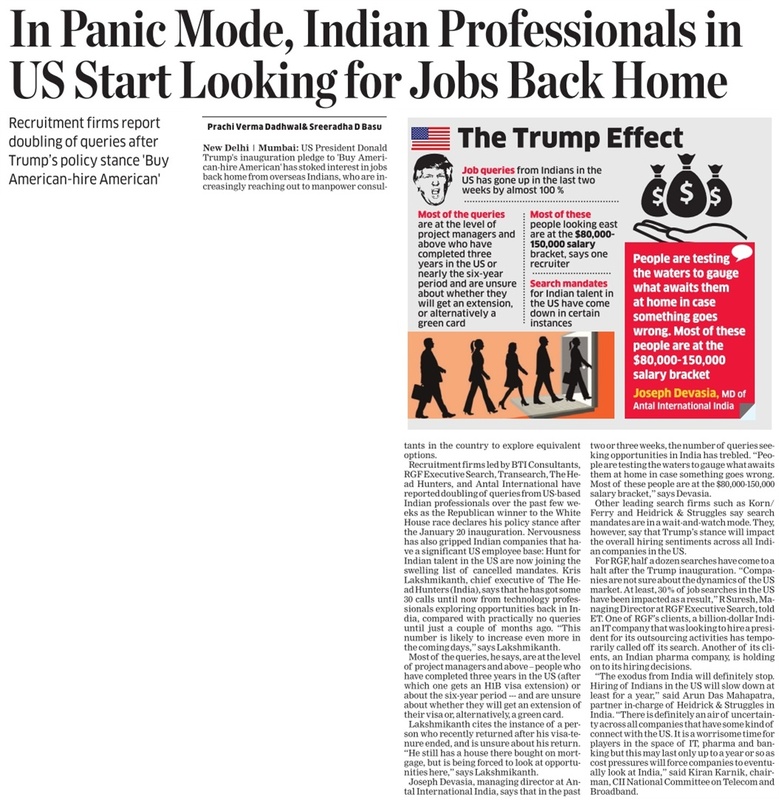 Recruitment firms led by BTI Consultants, RGF Executive Search, Transearch, The Head Hunters, and Antal International have reported doubling of queries from US-based Indian professionals over the past few weeks as theRepublican winner to the White House race declares his policy stance after the January 20 inauguration. Nervousness has also gripped Indian companies that have a significant US employee base: Hunt for Indian talent in the US are now joining the swelling list of cancelled mandates. Kris Lakshmikanth, chief executive of The Head Hunters (India), says that he has got some 30 calls until now from technology professionals exploring opportunities back in India, compared with practically no queries until just a couple of months ago. “This number is likely to increase even more in the coming days,” says Lakshmikanth. Most of the queries, he says, are at the level of project managers and above – people who have completed three years in the US (after which one gets an H1B visa extension) or about the six-year period — and are unsure about whether they will get an extension of their visa or, alternatively, a green card. Lakshmikanth cites the instance of a person who recently returned after his visa-tenure ended, and is unsure about his return. “He still has a house there bought on mortgage, but is being forced to look at opportunities here,” says Lakshmikanth. Joseph Devasia, managing director at Antal International India, says that in the past two or three weeks, the number of queries seeking opportunities in India has trebled. “People are testing the waters to gauge what awaits them at home in case something goes wrong. Most of these people are at the $80,000-150,000 salary bracket,” says Devasia. Other leading search firms such as Korn/Ferry and Heidrick & Struggles say search mandates are in a waitand-watch mode. They, however, say that Trump’s stance will impact the overall hiring sentiments across all Indian companies in the US. For RGF, half a dozen searches have come to a halt after the Trump inauguration. “Companies are not sure about the dynamics of the US market. At least, 30% of job searches in the US have been impacted as a result,” R Suresh, Managing Director at RGF Executive Search, told ET. One of RGF’s clients, a billion-dollar Indian IT company that was looking to hire a president for its outsourcing activities has temporarily called off its search. Another of its clients, an Indian pharma company, is holding on to its hiring decisions. “The exodus from India will definitely stop. Hiring of Indians in the US will slow down at least for a year,” said Arun Das Mahapatra, partner incharge of Heidrick & Struggles in India. “There is definitely an air of uncertainty across all companies that have some kind of connect with the US. It is a worrisome time for players in the space of IT, pharma and banking but this may last only up to a year or so as cost pressures will force companies to eventually look at India,” said Kiran Karnik, chairman, CII National Committee on Telecom and Broadband. While Korn/Ferry International managing director for India, Navnit Singh, calls it the wait and watch phase, Transearch (India Office) managing partner Uday Chawla describes the Trump impact as “procrastination of decisions” in all sectors, leading to an increase in the cycle-time for searches. This article appeared in Economic Times on February 01, 2017 and carries a quote by Mr. Joseph Devasia, Managing Director Antal International India.